Prof. Dr. Uta Hinrichs from the University of St. Andrews in Scotland visited the project group of Prof. Dr. Harald Reiterer at the University of Konstanz end of October 2017. During her stay, she held an interesting talk about ‘Visualization as a Process’ where she illustrated the benefits and drawbacks of different visualization tool paradigms on the visualization creation process and outlined how an emphasis on “process” may open up new ways of discussing the role of visualization across disciplines and contexts. 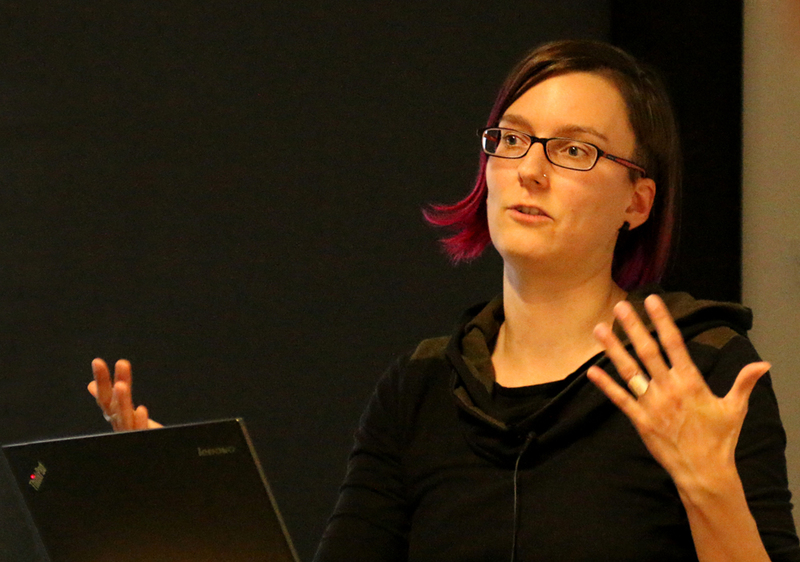 Uta Hinrichs during her talk about ”Visualization as a Process’ at the University of Konstanz. In your talk you said you had access to a house full of science fiction stories. Where do they all come from and who collected them? Together with Dr. Stefania Forlini from the University of Calgary, I am working on analyzing and visualizing a collection of science fiction stories – the “Gibson Anthologies of Speculative Fiction” – which have been put together by the avid collector and science fiction fan Bob Gibson. These 888 anthologies consist of more than 11,000 SF stories, poems and illustrations that Gibson collected from literary magazines and periodicals. He cut out the stories and assembled them into little fanzines that he manually bound, illustrated, and annotated. These anthologies are but a small part of the Bob Gibson Collection of Speculative Fiction that consists of approx. 40,000 books, magazines and related materials (including the Gibson Anthologies). This collection which literally filled his entire house was given to the University of Calgary Library after Gibson’s death in 2001, and is now organized and maintained by the University of Calgary’s Archives and Special Collections. What made you want to work on a collection of science fiction stories? Are you a science fiction fan? I would not call myself a science fiction fan, actually, but I am really interested in how to transform physical collections like the Gibson Anthologies into digital form in order to make them explorable by both scholars and the general public (including science fiction fans). Stefania started to work with the collection at the University of Calgary when I was just about to finish my PhD in Computational Media Design. It became clear that the exploration and analysis of such a vast, untapped collection requires digital approaches such as information visualization, and given my experience in working at the intersection of visualization, art, and design, Stefania invited me into the project. This was in 2012 and we are working together on the collection since. What is it that you analysed there? The collection was completely unexplored when we first started to work with it, so our first challenge was to design visual interfaces that would help us explore this vast collection of science fiction items from multiple perspective – showing their distribution over time, author names as well as common themes. Gibson had a unique classification system in place based on 78+ symbols that he assigned to individual stories, but he did not leave us a clue how to read this system. So, the first questions we explored (and we still work on this) is “What is all this stuff?” and “How did Gibson classify the stories he collected?”. What are the most interesting results you had so far? We have already identified a large range of completely unknown authors in this collection, including a surprising number of women authors. Also, analyzing the themes within the oldest stories of the collection shows that a lot of them are about “the supernatural”. This is interesting as it shows how closely intertwined supernatural themes were with more typical topics of science fiction such as “Technology”. These insights show that the collection can provide new perspectives on the evolution of SF as a genre. Applying an intertwined process of archival work and visualization has helped us generate these insights. We have also deciphered a number of Gibson’s symbols, but we do not yet have a good understanding of his classification system. Are there other anthologies you want to analyse? So far, we have only worked on a small sub-collection of 72 (out of 888) anthologies. Although there is still a lot more to analyze in this sub-collection, we are in the process of slowly expanding it, digitizing more anthologies. We are currently applying techniques from computational text analysis, to classify the anthologies and included science fiction stories further. We are also exploring new ways of transforming these visually unique physical items into digital form, while providing a glimpse not only into their content but also their material qualities. From a visualization perspective, this is a fascinating challenge. 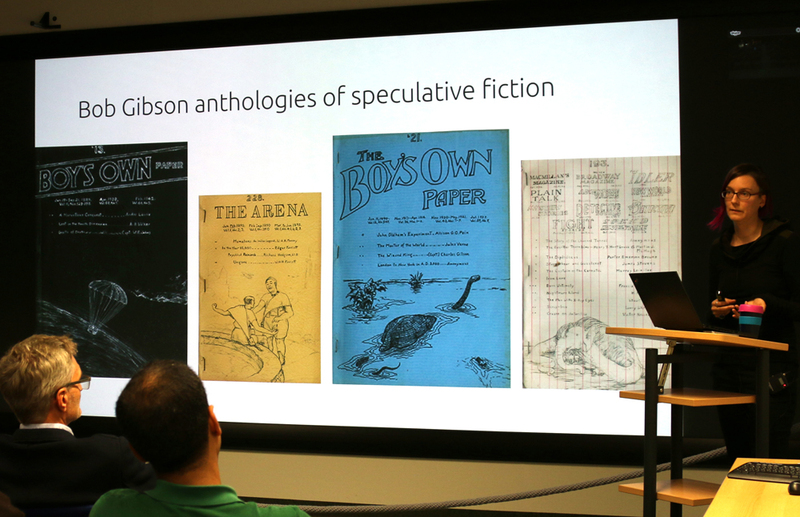 Uta Hinrichs told about her work on analyzing and visualizing a collection of science fiction stories – the “Gibson Anthologies of Speculative Fiction”.